There is just something about the “Certified Organic” label that has always seemed a little dubious, but perhaps you didn’t know exactly why. Well, it turns out you have good reason to be suspicious about that can of “organic” Campbell’s soup or M&M Mars’ Dove Organic, developed specifically for Wal-Mart. The New York Times reported in Sunday’s paper that since 2002, when the Agricultural Department started regulating and legalizing what could and could not be included in Certified Organic products, 250 non-organic and synthetic compounds have been approved by the National Organic Standards Board — the organization that is supposed to protect consumers from that very thing happening. Why would such a board do such a thing? For starters, most organic companies (Bear Naked, Kashi, Odwalla) are now owned by large corporations such as Kellogg, General Mills, Coca-Cola, Pepsi and Cargill (the full extent of the evil of which can be seen in the fact that it recently had to recall enough ground turkey to fill the Empire State Building six times). It is, of course, in those companies’ best interests to loosen the Certified Organic standards. And guess who occupies many of the seats on the Standards Board? You got it, corporate executives from those very companies. It’s the very definition of the fox running the hen house. Carrageenan, a seaweed-derived thickening agent used in many dairy products, has been known to cause inflammation in the gastrointestinal tract and degraded carrageenan (which, according to independent studies, all food-grade carrageenan tested contained at least some and up to 25 percent) is listed as a possible human carcinogen by the World Health Organization. Inositol is a naturally occurring nutrient, but its synthetic version, which is manufactured using chemical processes, was approved for organic products last year. Ammonium nonanoate, a herbicide, was not approved, but six board members (from General Mills, Campbell’s Soup, Organic Valley and Whole Foods) voted in its favor. Members of the Board have also voted in favor of allowing “organic” egg producers to give their chickens just two square feet of living space. Docosahexzenoic acid algae oil, or DHA, and arachidonic acid single cell oil, or ARA have been approved for use in baby formula. One of the seats that, by law, is reserved for a farmer — as in one who owns and operates a farm — is filled by a manager from Driscoll’s. She does work with farmers, reports the Times, but still, she is not a farmer. Katrina Heinz, an employee of General Mills, was originally appointed as a public interest representative, but amid public outcry was removed from that position and later reinstated to the Board in the “scientist” slot. 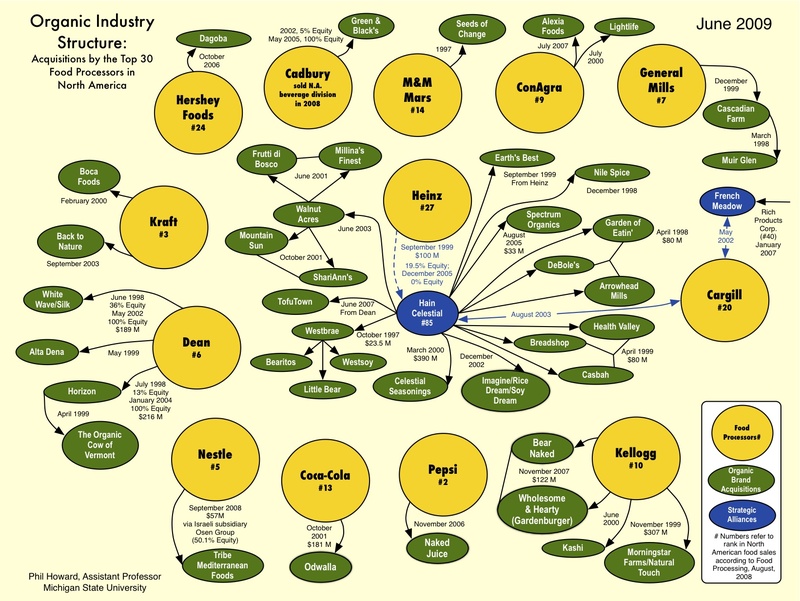 The Cornucopia Institute, in an extensive report called the “The Organic Watergate,” [download the PDF] details corporate influence on the organic program. The Institute encourages concerned consumers to take action and sign its letter to USDA Secretary Tom Vilsack and NOSB Chairman Barry Flamm demanding accountability for organic labeling. Cornucopia also cites the research into the organics industry (which has become a $20 billion a year agri-business in the U.S. since the implementation of “certified organic” regulation) of Dr. Phillip H. Howard of Michigan State University. Dr. Howard’s reports and infographs provide a bracing look into the dramatic takeover of the organics business by corporate concerns. Now, are smaller companies always good and transnationals always bad? Of course not. But when you consider that a company like Cargill’s interest in organics is finding a market for nutritionally enhanced organic additives such as phytosterols, soy isoflavones, trehalose, inulin, and chondroitin, you get very, very suspicious. While independents organic companies such as Eden, Clif Bar, Amy’s, and Lundberg and a few others hold out, it’s left to consumers to decide whom to trust, as the “certified organic” regulation continues to be rendered ever more toothless and meaningless.